If you live on the top floor of your building, then your room must be feeling like an oven in summers and a freezer in winters. Your A/c takes hours before the room becomes cool and becomes HOT within few minutes of shutting the air-conditioner. Very frustrating, isnâ��t it! That's because the ceiling & sun facing walls have been absorbing heat all day. The reverse happens in winter, the room you spend a fortune on heating up transfers that heat to the outside. Same is the case with water in your overhead tanks which gives you boiling hot water in summers when you want a COOL Bath and freezing cold water in winters when you would want a warm water bath. Your electricity bills shoot up when you switch on your a/c, heater or Geyser, but there was no alternative till date. WONDER COAT SPECIAL IMPORTED CHEMICAL creates a tightly packed dried film with minimal paths for heat transfer resulting in very efficient thermal barrier. Why wait? BuyÂ our "Thermal Insulating Paint", use it and start saving on your heating and cooling costs today! How much will you Save with WONDER COAT Thermal Solution Products? Savings depend on how many areas of your home you apply our products. Your savings will depend on many factors including, how many surfaces you apply the insulating coatings to, number of coats, colors used (darker colors absorb more heat), type of construction, amount of ventilation you have etc. If you applied our products to all the areas of your home that we recommend, you will realize dramatic savings. WONDER COAT Paint can Reduce Heating Bills, provide comfort AND Save Money. Extensive studies, evaluations and test results confirm that ceramic filled coatings control heat through reflection at the source substantially reducing the absorption of heat by the substrate. THINK ABOUT IT! 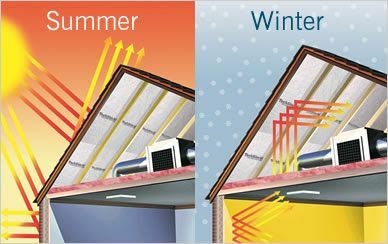 Reflecting heat back to the source and rapidly dissipating it is the answer to keeping heat out in the summer and keeping heat in during the winter rather than ONLY slowing down the conduction of the heat with traditional insulation! Compare a roomÂ painted with WONDER COAT paint and a conventional room. You will see why your Cooling bills are so high! Air condition Duck work, Bus Conversion interior Engine, Area ,Roofs, Chicken Farm Roof Tops, Grain Silos, Metal Roof, Mobile Home Roofs, Potable Water Tank, Recreational Vehicle roof â��Exterior, Refrigeration Trailer Roofs, School Bus Tops, Truck Van Bodies, Water storage Tanks,Refrigerator,Cold Storage,,Frezer Truck, Over head Tanks, Petroleum Trucks, Walk in Coolers,Frezzer,Living quarters Roofs, Military Installation, South & west Walls of Metal, Building, Airplane Hangers, Corrugated Roof Tops, Garages, Horse barns, Hulls of Ships, Milk or Ice delivery Trucks, Walls/Ceiling, Reflective walls in steel. Q : I live in a Cold climate, will WONDER COAT work for me? A : Yes! Remember that heat travels to cold! The heat inside your home wants to escape toward the cold outside air! WONDER COAT on your interior walls will help stop this outward heat loss and help to maintain the comfort level of your home! Q : How many coats of paint should I apply? Q : Should I use WONDER COAT both inside and outside? A : Yes! For the optimum in energy efficiency it is best to use WONDER COAT both inside and out, however either application alone will give you increased energy efficiency! Q : Can I paint over WONDER COAT at a later date? A : Yes! However a slight decrease in performance may result. Q : Can WONDER COAT be sprayed? (imported chemical from paint) and use a slightly larger spray tip than normal! Q : Can I tint the WONDER COAT Paint? A : Yes, any local paint store can tint WONDER COAT paint to the color of your choice. But with darker shades you compromise Thermal efficiency.